It was delight to find a website about the old Boat Support Unit One. I was at BSU-1 from early 1970 until my discharge in June 1971, and I deployed with MST Two Detachment Golf in September 1970 returning in March 1971. We operated an MSSC and LSSC out of Long Phu across from what was called Dung Island near where the Bassac goes into the South China Sea, supporting both US and Vietnamese SEALs. It's only recently that that I discovered that I was interested in re-visting those days and my memories and records are very incomplete -- sadly, I can't for some reason even remember the names of the other detachment members. I am, however, finding that Web pages such as yours have been a big help in jogging my memory, and things are beginning to come back. I'm also thinking of seeing what an FOIA request might reveal. My "Navy file" does contain a travel voucher that I had to fill out for some reason, and it's my best record of the deployment. As was no doubt your experience, we flew to Vietnam on a prop-driven C47(? ), and my travel voucher shows that we left North Island on 9/11/70 and didn't get to Vietnam until six days later. Coming back was quicker for some reason, we left Viet Nam on 3/19/71 and were back in San Diego on the 23rd. I've attached the only two pictures that I've had scanned so far, which are better pictures of me and the rest of the detachment then they are pictures of the MSSC. I have about eight other pictures that I've dug up, including some good pictures of the inside of the MSSC taken I think coming back from some operation, but I haven't got them scanned yet. 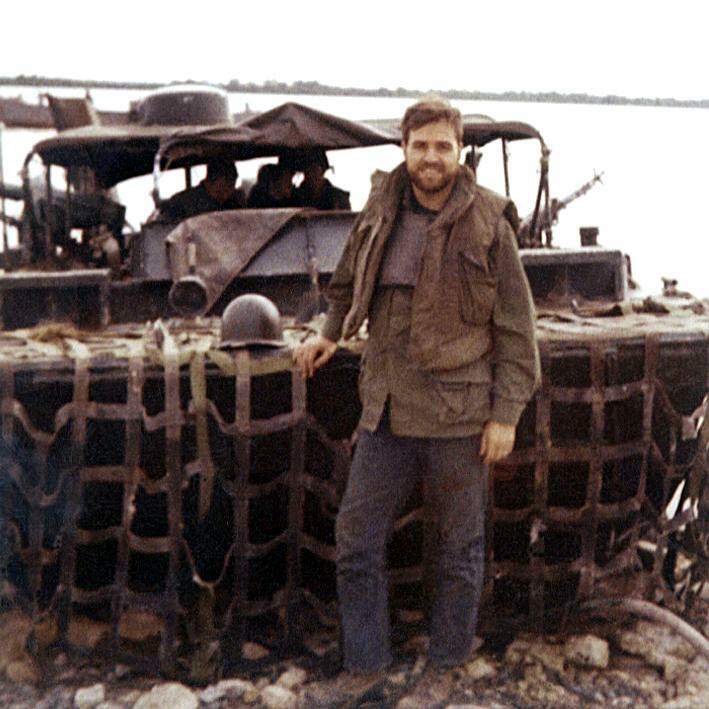 My recollection is that there were four MST Two detachments and SEAL platoons in the Delta at the time I was there, reporting to and supported by the NavSpecWarfare Group's operation in Ben Thuy, which was a nice drive up river from us. If you replaced a detachment at Ben Luc in June that would be one. I remember there was one detachment supporting what I've just discovered is called the "Unlucky X-ray Platoon," who got themselves and some MST people shot up pretty bad on February 28, 1971 (See -- http://history1900s.about.com/library/prm/blgreenfaces4.htm). I can remember visiting the survivors from that episode. 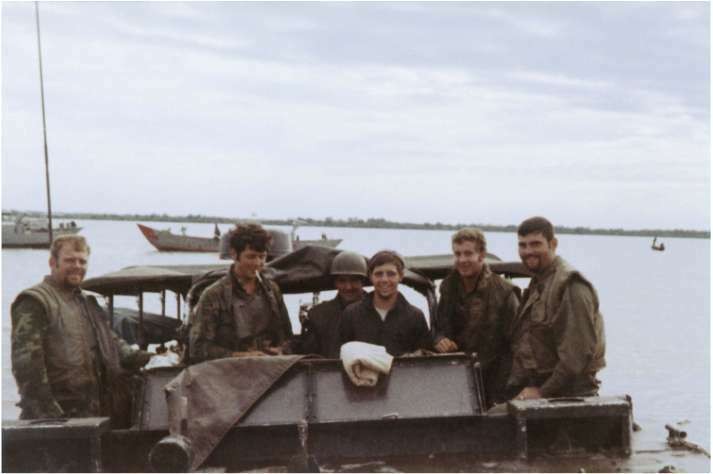 And there was another Detachment operating out of SeaFloat, way south -- I remember that an MST-Two officer earned a Silver Star for suppressing fire with I think an LSSC's 50 caliber and rescuing survivors after virtual everyone had been blown out of the boat by a B40 attack. I felt lucky both as to the SEALs our detachment worked with and as to our location. Our SEALs and particularly our SEAL officers were very professional, and Dung Island wasn't as hot as as it had been earlier. We extracted the SEALs under fire on a couple of occasions, called in Black Pony air support at least once, and it was not uncommon to receive fire following extractions while exiting the relatively long narrow canal running through the center of the Dung Island complex, but we always just gunned the engines and suppressed fire with everything we had, particularly using the power of the .50 and the sweet buzz of the minigun. On an operation that I wasn't on, the LSSC received a nice size dent from a B40 that hit it but did not explode. I guess the bottom line is that none of us or the SEALs we supported were ever even wounded, and for that I've remained most thankful. At any event, I just wanted to check in and say thanks. Please feel free to include me in the alumni directory, and if there is anything else I can do to help, please let me know.